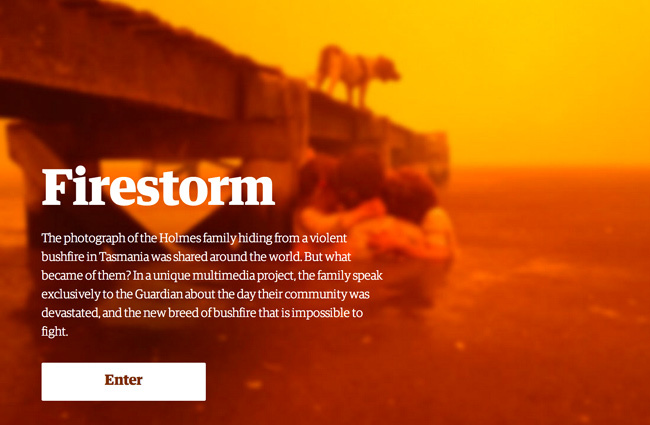 Carefully planned as a spectacular launch to the Guardian’s new Australian edition, “Firestorm” is a rich interactive telling the story of the astonishing forest fires that engulfed the town of Dunalley, which came to the world’s attention thanks to a photograph of the Holmes family sheltering from the flames in the water. At Hacks/Hackers London, Jon Henley and Robin Beitra talked about how they made it. Jon Henley was the lead reporter on the story for the Guardian and he admitted that the paper had been looking for some time for something with which they could do a “Snow fall” equivalent. “I don’t think I can put that any other way,” he said, in reference to the critically acclaimed immersive story-telling experience that the New York Times published about an avalanche at Tunnel Creek. Jon described Snow Fall as “the first time a newspaper had tried to present a classic bit of long form online.” But, he said, it was a very, very long piece of text. “Beautiful as we found it,” he said, “we are yet to find anybody who read right the way through to the end of it.” They certainly admired the approach though, and said that the Guardian, as every news organisation does, desperately wants to find a way to make long form journalism work online. Approaching it from a purely journalistic point of view, though, he had two main concerns. Firstly, would the family “play ball”? Without their input, the piece would be lacking the crucial human element. And secondly, was there really a big story here? He spent a lot of time digging around and came to the conclusion that there was. Not just a family sheltering from the flames, but a tale that touched upon the environmental fragility of areas of Australia, and how fire-fighting policy changes had made a difference to the way the Dunalley fire was handled. And there was the small matter of the fire apparently leaping across 3km of open water. If that can’t be considered a fire-break anymore, Jon argued, then that is an important thing to know. Jon explained that the story he wrote was designed to work in three formats: a lengthy piece in the printed paper in the UK, as an ebook, and as the bells-and-whistles immersive interactive. The ebook included lots of stills from the video and extended biogs of some of the principal characters, making it more interactive than the flat piece in the paper. It is nice to see the Guardian Shorts brand, which I was involved with when I worked at the paper, evolving beyond linear text. Jon said that sales of the ebook will probably cover the costs of the reporting trip out to Australia. One problem with the ebook is that it made synching the launch difficult. As I know from experience, you press the big publish button in the Amazon or iTunes store, and then at some undetermined time in the future your product goes live. That doesn’t work when the subject of the book is an integral part of the choreographed launch of Guardian Australia. They couldn’t risk the ebook appearing in stores before the interactive had gone live, and so the ebook wasn’t available initially. This probably cost them sales, Jon thought. Jon said he enjoyed writing the ebook, as it meant shutting himself away and converting his 6 notebooks worth of reporting into 15,000 words. He deliberately structured it so that the human story of what happened in Dunalley is interspersed with more technical chapters about how some of Australia’s flora relies on fire to propagate, or the debate about whether fire devastated communities should be rebuilt at all. Having lived on Crete, I’m aware there is nothing more ominous in a land prone to wildfires than the sound of the fire-fighting helicopter buzzing low over your house. As it desperately ferries sea-water inland to drop on the inferno, it is impossible for you to tell how far away the fire is, or how fast it might be advancing, except by mentally timing the frequency of the trips. Given that the event last week was a Hacks/Hackers evening, developer Robin Beitra was on hand to supply some information about the technical background to Firestorm. He said that they’d had about two months development time, and in terms of the stack used, they’d employed Node.js/Grunt, Sass, RequireJS/almond, jQuery and Tweenlite. Daan Louter — yes that guy — had worked on some prototypes of design and navigation before Jon had returned from Australia with the material. He touched a bit on the usability of the piece, which was tested in the Guardian’s in-house testing facility at Kings Place. They learned that it was generally best to stick to native controls wherever possible — deviating from them guaranteed user confusion. Touches like the “Scroll to continue” cue came out of testing sessions where people needed more of a prompt to explore, although, Robin wryly observed, users can still sometimes be determined to disobey even that simple instruction. Robin said it was inevitable that these type of projects were time-consuming. He doubted that you could just rustle up some templates to allow you to crank them out. In part this is because the form is so tightly aligned to the content, and the build process involved a lot of recutting video and editing text to ensure that it worked closer together. In terms of workflow, Robin said that supporting various video formats and codecs had been a right pain, because every time you made small changes to video, you had to re-encode multiple versions. They’d designed it for desktop and made it “minimally” responsive for tablet. One thing I found personally was that as soon as it was launched there was a lot of Twitter chatter that the Guardian had “done a Snow Fall and this time it works on phones”. Up to a point — there are several bits when browsing on the phone where key detail in the graphics are lost because it is too small to read or has ducked behind text. The Telegraph’s recent venture into this kind of area — an essay about the Tunnock’s factory — avoided this bind on mobile by simply presenting the phone user with an altogether more linear, traditional experience. It was obvious that Jon Henley had been intrigued by working with the interactive team on the story, and having this group of people churning out code to make the words and images come together how he wanted. “I started on a typewriter,” he said of his career. Some of the most amazing bits of this project, he explained, were sitting down in a room with 6 or 8 other people, and literally writing on top of the b-roll video footage. He described it as a really interesting experience, seeing how text worked so differently with images and video behind it. Most of all it was clear that Jon relished the reaction to the piece. They’ve seen average dwell time on the page at 17 minutes, when most Guardian videos, he said, barely reach the five minute mark. They’ve had 750,000 page impressions on the piece, and Jon said they’ve been “bathing in Twitter love” for a month, in a profession where you seldom get that kind of reaction. By comparison, the New York Times was getting around a 12 minute average dwell on “Snow Fall”, and UsVsTh3m users have clocked up a 7 minute average on Icefail. Not that I’m convinced that dwell time is always the most significant metric to be chasing, mind you.